Chen Zhen (Li) returns home to learn that his childhood school has been overtaken by Japanese fighters and that they have killed his beloved master. Zhen goes on a quest to bring the killers to justice in an effort to restore honor to his mentor and school. 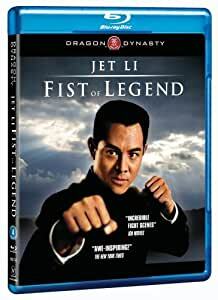 I first bought Bruce Lee's "Fist of Fury", as it is the original version, and although he is amazing to watch, Jet Li's "Fist of Legend" is simply better. It is probably the best Martial Arts Movie that has ever been made. And much of is due to Jet Li's personality, never to start a fight but to stand up for what he thinks is right. And then there is the relationship with the young woman in Japan while Japan is occupying parts of China from 1931 to 1945, Japan's unconditional surrender, who is being rejected by the Chinese, not even allowing them to get married (Japan also refuses to let them get married) with the result that Jet Li is forced to leave "Jing Fu Men" as he does not want to leave the woman he loves. There is a warmth in "Fist of Legend" that just does not exist in Bruce Lee's. All in all, there is no weak point in this movie except for the Japanese solders who look absolutely ridiculous. I have watched "Fist of Legend at least a dozen times. This is very simple. While easily the best this film has ever looked at home, the sound and subtitles are a huge issue. First of all, the subtitles are DUBtitles. The English dubbed track verbatim, word for word. As such, the script is dumbed down and at times, laughably bad. This title deserved a proper translation and since such translations are out there, even among the fansubs, this is inexcusable. Even more so when you realize plenty of true fans would offer to redo the subtitles for free, just so that this release was proper! Also of note is the sound, which despite claiming original mono, is not. This is a remix, dumped to mono. The soundtrack on the old laserdisc is far superior sonically. The remix, be it presented in mono or 5.1, is shrill and has none of layers inherent in the original mix. And in case you are wondering, the English dubbed tracked does not exist in this dojo! And finally, there is the issue of the opening credits and close of the film. They are from the American version, so the credits look like they were created on someone's old Macbook in Paint Shop Pro (it's really laughable) and the final moment of the film is removed, which is a shame. As it is a spoiler, I don't want to say exactly what. Those of you who know the film will understand. Dragon Dynasty never got a single release right prior to this one, so I guess we should have expected them to drop the ball. And they did. What a shame. Fist of Legend, the movie, is a solid 4.5 star event. Jet Li is fast, fast, fast. The fights are not too repetitive and the story isn't annoyingly bad. I probably have a soft spot for this movie, but I really can't think of too many pure martial arts flicks in my library that are better (maybe Drunken Master). But FULL DISCLOSURE I don't practice martial arts and probably could not tell you the first thing about it. All I know is that this is entertaining and head-and-shoulders above a good deal of Li's later, blockbuster-type stuff. Now the real review and the reason for giving the Blu-ray 3 stars overall. Most of the movie looks great, and certainly better than the VHS copy I have been working with since high-school, but that's just what you would expect. The last third of the movie, though, looks pretty bad. There is a light, black line running vertically along the right side of the image in about 5 scenes. During the last fight when Chen ends up in the small courtyard there are artifacts all over the image - it looked like rain at first - but it's just a light dusting of "snow" on the image for most of that scene. And, finally, the subtitles and audio are a major step down from my old copy. I don't speak Cantonese or Mandarin, so I'm not evaluating faithfulness to the spoken language. My beef is with the subtitles being out of sync with the audio and characters having multiple voice actors (it seems!). Also, referring to Japanese swords as "Sabers" seems weird, especially when the person talking is Japanese. At the end of the day you should be watching this for the martial arts, which are at least worth 4 stars, but when you buy a Blu-ray it seems reasonable to have certain expectations regarding the video and audio. Since those expectations weren't fully met, I give the Blu-ray 3 stars overall. If there were half-star ratings I would give Fist of Legend 3.5 stars. I ordered this movie after reading a review from a source outside of Amazon. After paying for the "two disk" version I received a "Special Collector's Edition" on time, no shipping problems, etc. When I opened the package, I discovered one disk. So, I emailed Amazon's customer service and received the usual prompt response and corrective action. No problem here. I told Amazon, I only have one disk when I was promised two. They said keep what you have and we will send you what you ordered. I, again, received the same item, the one disk version. I am not filing a claim as I believe the product is mislabeled. Where it reads "two disks" it should read "Special Collector's Edition"
Take note if you purchase the "two disk" version for $5.98 (or close to it) You will only receive one disk.